Apologies to those who tried to find this web page earlier! I jumped the gun a little bit, setting up the cards and the notices before getting the web hosting itself online. Oops! The name of the boat comes from an early Dutch exploring ship. The name was bestowed by the immediately previous owner, and I saw no reason to change it. The opening salvo (6 Jan 2019). This was intended as an everybody-email, but I never sent it. A brief statement of intent. The point of the MMSI number is to give you a single searchable identifier. When underway, the boat broadcasts its location information via AIS (Class B transponder), which is picked up and re-broadcasted to various shoreside websites and apps. I use Marine Traffic (iOS or Android), also in web page form, but there are many others. Be aware that, because of limitations on this AIS location transfer mechanism, while out at sea the messages are tracked only line-of-sight VHF and by satellite, and not routinely picked up by the stateside web services. (Other boats in the vicinity see us just fine.) It can be somewhat heart-pounding to sit on shore and wonder whether the boat has disappeared from the earth, or just from the map. I speak from experience. Don't panic. And if you want to follow along the weather reports, I recommend Windy (an app, iOS and Android) or a web-based service PredictWind. Here too there are others. 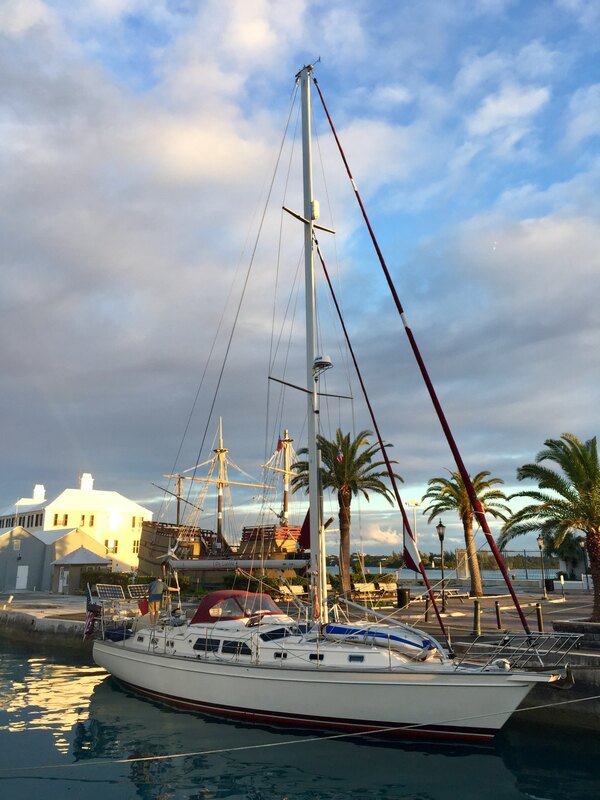 *Annapolis to Bermuda, 5 January 2019 to 10 January 2019. *Bermuda, for repairs, 10 January to 24 January 2019. *Bermuda, for more repairs and weather, 24 January to ?? 2019. Anguilla to BVI, 10 February to 17 February 2019. At the Annapolis dock, summer 2018 (me). At the Bermuda dock, January 2019 (RF-B). In addition, you should be able to reach us by writing to svdeliefde@myiridium.net. Be aware that texts and e-mails to the boat address are shared among all the people on the boat at the time, so are not particularly private. Private messages should be conducted by voice, or (when in port) over WiFi. 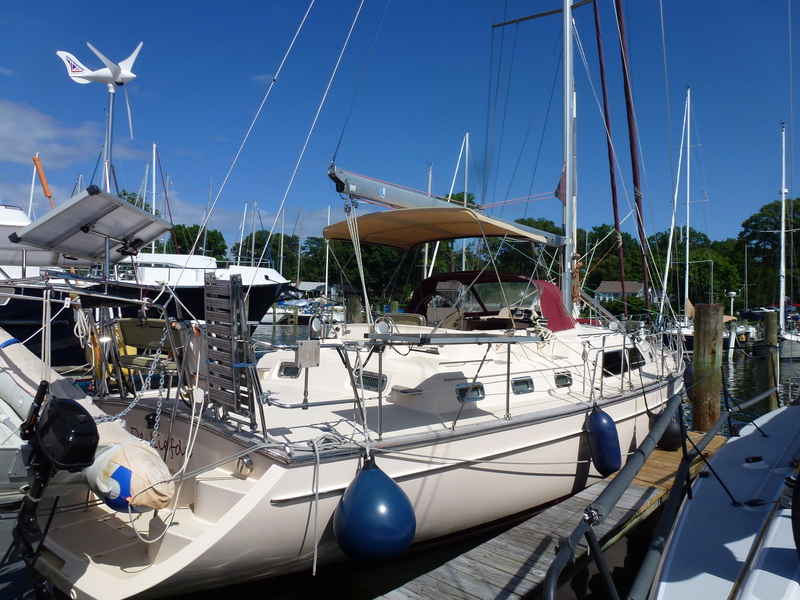 A note on S/V versus S/Y.The US sometimes refers to sailing vessels, or S/V for short. The rest of the world, where this boat will be much of the time, refers to S/Y or sailing yacht, without any connotation of pretentiousness. See for example a Cruisers Forum thread. However, the name sydeliefde is already taken in many contexts (Gmail, myiridium.net, etc. ), possibly by the previous owner of this boat! (Looking into it.). So: be aware that some of these identifiers and addresses are spelled with a v.
Return to Eric's home page. Or write to Eric at my snail-mail address.